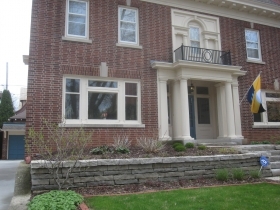 Classic Terrace Ave. Home on NARI Tour. Photo by Michael Horne. 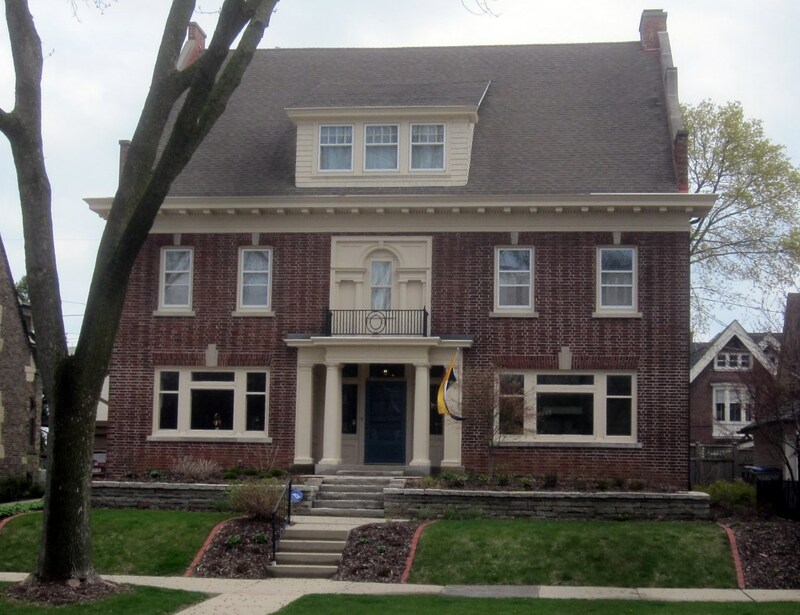 Every year at about this time, Milwaukee/NARI (National Association of the Remodeling Industry) hosts a tour of a score of homes its contractor members have worked on recently. It takes place May 19-20th this year, and most of the projects involve kitchen remodelings, bath and powder room improvements and additions. These are all vital and useful improvements that bring a smile to the face of the assessor, and preserve the value of one’s home, along with the comfort of the residents. Perhaps the most intriguing project description of all is a “Lower Level Authentic Irish Pub with Entertainment space, Poker Room and Streetscape of ‘Streets of Dublin. '” That’s got a little pizzazz to it! 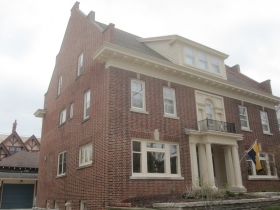 This Joycean fantasy has earned a N. Terrace Ave. home the distinction of being this week’s House Confidential Honoree. 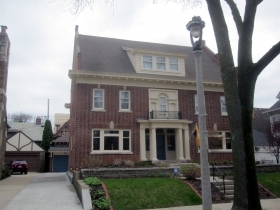 The five-bedroom residence with no fewer than four bathrooms plus two half-bathrooms was built in 1911 for John F. Woodmansee, the owner of The Daily Reporter. The paper, which is still being published, was owned by the family from 1903 to 1994. It specializes in printing legal notices. The home is located in Gilman’s Subdivision of Lockwood’s Addition, which was platted in 1876. Yet in 1911, the year it was built, it was one of only a handful of homes that had been constructed in the prime location. Yet the subdivision to the north, not platted until 1893, was nearly fully developed at the time. Why was this so? Blame infrastructure — or the lack of it. It is clear that those who could afford to purchase a house in the eighteenth ward (North Point and surrounds) expected to move into a dwelling with running water, flush toilets, and a finished street, on a block with good access to the rest of the city. In fact it was not until 1900 that these amenities were in place. The home churned through a number of owners over the years, including Mrs. Irene Stephenson and then Lucille Shockley, followed by Francis C. “Frank” Papen, who was apparently the first of the home owners to make use of the services of remodeling contractors. He paid $26,000 for the home. It looks like Mrs. Papen got a Christmas gift from her husband when Uihlein Electric Co. took out a permit on December 24th, 1958 to wire an outlet for an electric clothes dryer. No more hanging out the laundry for the Papen household. In March, a few months later, $500 was spent to remodel the kitchen. This eliminated a “closet” (actually a butler’s pantry) and occasioned the relocation of the entrance door. In April, 1959, the electric service was boosted to 100 amps, feeding 18 new outlets, nine new fixtures and wiring for a new electric range. 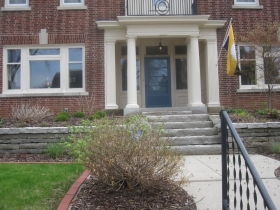 In 1969, the upstairs bathroom was enlarged, and a second bath was installed above the existing first floor porch, along with the relocation of some windows and doors. That was a $3,000 job back then for the remodeling contractor. In 1983, owner Tom Bergman had some electrical work done in the first floor powder room and second floor utility room, and two years later Loving Electric Co. boosted the amperage in the house to 200. 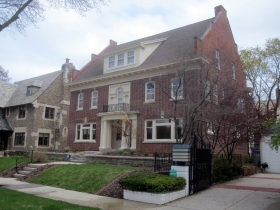 In 1998, the home was owned by David Lucey and Ann Rienke. Lucey is a partner at Foley & Lardner, with litigation experience, among other areas, in “architecture, engineering … real estate brokerage,” according to his biography. His father, Patrick Lucey, a former governor, was active in Madison real estate circles. The younger Lucey was therefore better prepared than most when the Board of Zoning Appeals denied his proposal to have Cletus Hasslinger of Living Space Design-Build Co. Inc. build an 8 foot, six inch x 14 foot, three inch mudroom addition to the rear of the house because it would exceed permitted lot coverage by 264 square feet. The appeal was successful, and the remodeling contractors rejoiced. In 2013, the home was offered for sale for $650,000. The work of the previous owners and contractors was acknowledged by listing agent Ellen Daroga: “This Flemish revival home has been lovingly cared for & updated since 1911,” she wrote on the pitch sheet for the residence, clipped out by the assessor and added to the home’s file. It was again listed for sale in 2016, with an asking price of $799,000, which reflected not only the increase in real estate values, but the further work of the diligent remodeling contractors. “A show stopper! In the heart of the Historic Water Tower District this magnificently appointed brick revival offers graceful lines, period moldings, built-ins … & thoughtful details w/a modern twist,” wrote the real estate agent, whose poetry captured a tour of the grand residence and its attributes. Along with custom radiator covers, about which a great deal was made, the home was equipped with any number of chandeliers, fine woodwork and such intriguing details as hidden storage behind the dining room paneling. These elements were all original to the home. 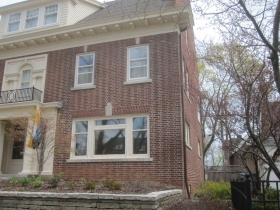 After 116 days on the market, the home was purchased by its current owner, accountant Brian P. Kennedy, for $775,000. It appears the first thing Kennedy did was to call Cream City Construction, a NARI member, and tell the firm to build him a subterranean Irish paradise in the original 31′ x 17′ rec room. You can take a look here — grab me a Lakefront IPA from the beer cooler while you’re at it — or see for yourself on the NARI home tour this weekend. Description: Home has been well-tended through numerous owners, and includes fine detailing along with quality construction. Polling Location: St. Mark’s Episcopal Church, 2618 N. Hackett Ave. Walk Score: 73 out of 100 “Very Walkable” Most errands do not require a vehicle. City of Milwaukee Average: 62 out of 100. At one point the side of the house pulled away and the bricks crumbled to the ground. Not sure of the date but that was a significant event in the neighborhood and costly for the owners.